The Minnesota Pork Board recognized Bill Crawford of Fairmont, Minnesota, as this year’s Distinguished Service Award recipient on February 4, 2019, at the Hilton Minneapolis. Bill Crawford’s dedication to the industry throughout his lifetime has not gone unnoticed or unappreciated, and the pork industry is lucky to have had his leadership and knowledge paving a path for future leaders. Crawford grew up on a farm near Pipestone, Minnesota, raising cattle and pigs. His career path led him down several different avenues, but he eventually landed in Fairmont, Minnesota, specializing in permitting livestock facilities and environmental issues, and continued his work there until his recent retirement in December 2018. Crawford immersed himself in the community, becoming active in the Martin County Pork Producers, Fairmont Area Chamber, and several other organizations, serving on various boards. He has spent over twenty-five years serving these organizations. Along with a group of his avid Minnesota Gopher Football fans, he travels to every home game he can attend in the group’s maroon and gold decked-out tailgating bus. Not only does he love the game, but he also uses the games as a way to reach out to fellow Gopher fans and opponents promoting pork. His dedication to promoting the industry is relentless, as is easily seen on his resume from the number of organizations he has partaken in over the years, and the awards he has received. 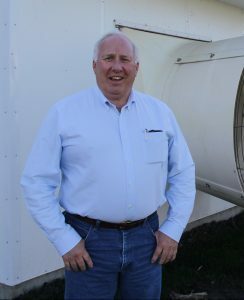 In 2005, Crawford received Minnesota Pork’s Pork Promoter of the Year Award. He also served on the Board of Directors for the Minnesota Pork Board for a total of either years with a term spent as President. Not only has he served at the state level, but he was a Minnesota State Delegate at National Pork Forums for eight years, and served two years as a member of the National Pork Board’s nominating committee. For Crawford, serving the industry was something he always felt motivated and compelled to do; he has spent much of his time motivating younger generations to get involved as well. “It’s gratifying to see the number of young people that are coming back to this area. I’m always trying to encourage them to be involved. It’s important for them to realize that government is run by those who show up. If you don’t show up, you’re not going to have a say in what happens,” Crawford said. “It’s not enough for farmers to just be out here feeding pigs, or raising cattle, or raising corn or soybeans anymore; we’ve got to keep people involved and keep people in-the-know, otherwise these organizations are going to get further and further away from us,” stated Crawford. He mentioned the trend for a decreasing number of farmers involved in township, county, and state leadership, and the negative effects that will have for all farmers in the future. There is no doubt the legacy Bill Crawford created will live on for years to come and continue to inspire future generations. His time and efforts to better the industry over the years are immeasurable, along with the number of people his influence has touched. The Minnesota Pork Board is pleased to award the Distinguished Service Award to such a deserving individual.